How much does it cost to travel to Dahab? How much money will you need in Dahab? E£253 ($15) is the average daily price for traveling in Dahab. The average price of food for one day is E£76 ($4.42). The average price of a hotel for a couple is E£273 ($16). Additional pricing is in the table below. These average travel prices have been collected from other travelers to help you plan your own travel budget. How much money do I need for Dahab? Dahab is a small town on the Sinai Peninsula in Egypt. It is located about 85 kilometers north of Sharm el-Sheikh and sits on the Gulf of Aqaba. It's a popular destination with divers and backpackers alike, and offers some of the best snorkeling and diving that you'll find in the Red Sea. It's a great alternative to the resort driven Sharm el-Sheikh, and is popular with independent travelers who are looking for affordable accommodation. There are some upmarket options however, predominantly in the Laguna area, but budget facilities are not hard to find. Dahab has a hot desert climate with weather that is similar to elsewhere in the area. Summers are very hot and remain warm even through the night. Winters are warm during the day and mild at night. Rain is rare year around, but the wettest month is usually March. Dahab is not about the sights, it's about the setting. The striking blue ocean meets the desert lands in a dramatic and beautiful way, particularly at sunrise and sunset. There aren't many specific sights in the area, aside from those found in the water. The scuba diving and snorkeling in Dahab is world renowned. 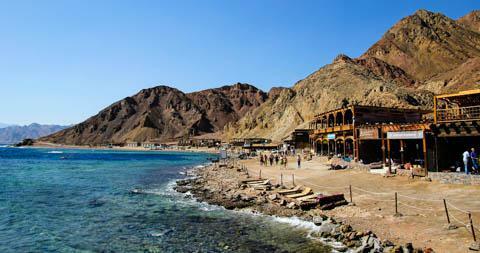 There are three main areas to Dahab. Masbat Bay is at the center of the town. It is split by a floodway with the tourist area stretching north to Eel Garden and south through Mashraba. This area has every amenity you will need as a tourist in Dahab. The Lagoona (El Goze) is a short taxi ride to the south of Masbat Bay. This is the location of Dahab's first resort hotels. There are also municipal services in the area including a bus station, hospital, and city council. Assalah is a residential area where Bedouin, Egyptians, and foreign expats live. There are also about fifteen resort hotels that spread north towards the Blue Hole and South to Wadi Gnai. Most of these resorts are booked as part of package tours. There are two protected areas near Dahab. To the south, Nabq Protected area begins at Wadi Gnai. In the north, Ras Abu Galoum Protected Area begins at the Blue Hole. Even if you're not certified to scuba dive, you can easily wade into the water with a mask and snorkel and have an absolutely breathtaking experience. The best times to enjoy the reefs are at dawn and dusk when many of the fish and sea life are out feeding. If you're more interested in scuba diving, there are plenty of unique opportunities in the area where you can experience it. The Blue Hole is perhaps the most famous dive spot in Dahab. It's popular to do a shallow dive in the Blue Hole and see the beautiful underwater scenery. There is an advanced dive option that takes you through the archways in the area. Do remember that if you do not have the necessary experience and skills, this can be a very dangerous dive. Do not attempt this dive unless you are familiar with the requirements and are comfortable with your skills. It is not worth the risks and is one of the more dangerous dives in the world. Other interesting sporting options in the Dahab area include windsurfing, kite surfing, rock climbing, camel treks, and horseback riding. Another popular option is to do a desert excursion. Many trips take you by camel into the desert. You can camp under the stars on the water's edge in a more remote and beautiful setting. Food in Dahab is usually good. There are some great seafood options, and some hotels offer all you can eat buffets on certain days of the week. These options are fun and filling, and they often include live music or entertainment. In addition to seafood you'll find typical Egyptian and Arabic foods. Meals are usually cheaper by as much as half the price if you eat at inland restaurants as opposed to those on the promenade. The most affordable meals in town include falafel, koshari, and chicken. There are buses that travel from Cairo to Dahab. The trip takes about 9 hours and tickets should be purchased in advance. There is an airport at Sharm El Sheikh. If you fly into the area it can be tricky to get from the airport to the Sharm bus station and taxis can be quite expensive. It is also possible to travel by ferry to Dahab from Aqaba in Jordan. Once you arrive in Dahab, it is possible to walk most places in Dahab. There's a promendade that runs along the waterfront and is lined with restaurants and hotels. Although it is possible to rent a bicycle in the area, the quality is usually low and this is not recommended. Local taxis are usually easy to find but, as with everything in Egypt, negotiate the price hard. There are also shared taxis, or mini-buses in the area. They usually follow a schedule and can make a good alternative to buses. Snorkeling in Dahab is one of the most amazing undersea experiences you can have. The Red Sea really is a beautiful as people say. The coral is amazingly colorful, the fish are abundant, and there's a wide variety of organisms you won't find anywhere else. The best way to experience the Red Sea is to have your own mask and snorkel. Then make sure your hotel is right on the water (almost all of them are) and you can head to the water in the early morning and at dusk everyday. These are the best times to see the fish out and about feeding. When the sun is low is easily the best time to see the most happening around the coral, so grab your mask and head into the water. Dahab is a great place to do a short camel trek. You can do anything from an hours ride to a multiday trek. The scenery is amazing where the beautiful blue water meets the red desert. It's like no other place I've ever been. Keep in mind, camels are quite uncomfortable when you decide on a duration for your trip. Some of the hotels offer wonderful all you can eat buffets on specific nights of the week. Wander down the street and you'll see them advertised on signs. They vary in quality, but most aren't bad, and some are quite good. Most include delicious barbeque and a live band for entertainment. The seafood is fresh and delicious. Make a note of what night they are and plan ahead to get a great deal on some delicious food.